I can mention a lot about this subject with various technical perspectives. But for a beginner, I would like to keep it very short on why it is important to practice on a metronome? (A) RIGHT HABIT – As humans, we’re not naturally inclined to play music in time. The best live performing artists fail to keep their tempo on metronome (if they have not practiced on metronome). Imagine two students training for 2 years, one with metronome and one without metronome. It is like 1000+ hours of practice and training of mind and fingers either with or without it, becomes part of your habit now. (B) SENSE OF TIMING – The metronome is constant, it does not forgive, it does not forget. Same way, playing to a metronome makes you consistent. It enables students to develop a subconscious habit and sense of timing. (C) PLAY DIFFICULT PASSAGE – It help us slow down difficult passages while keeping the pace consistent. This approach enables us to work through challenging passages without making any mistakes and we can gradually increase the speed to more levels as we become more familiar to piece. Posted on August 24, 2016 August 25, 2016 Categories Guitar Counseling & ArticlesTags Guitar practice, metronomeLeave a comment on Music Tip | Why Practice on a METRONOME? There are so many oldies and beautiful Bollywood songs composed on Waltz Melody. Let me share you 5 of them of year 1960’s. You can also try them on Guitar and enjoy. Rare Guitarists are capable to play them on Guitar. I love them and I always bring my students to perceive different melodies. As a guitarist, your music repertoire need not to be biased to this or that. Music is Music. Sometimes certain melodies and phrases are not easy to relate for young learners but with time one can enjoy the beauty of them. I call this music maturity. This beautiful composition is actually played in cycle of 6 beats but on Guitar, you can also count it in 3. Grammy Winner Pt. VM Bhatt talks on how one should see music as a career in this cut-throat competition. He mentions that most musicians commit mistake of ignoring their technical study or not completing their academic study. He also suggests that earning bread and butter through music shouldn’t be the target but you should settle your bread and better first and keep music side-by-side. Eventually music success is dependent on passion, talent and opportunities and it will come at its right time. After conducting employee engagement for thousands of employees and plethora of corporate for more than 10 years now. Here I want to mention other powerful reasons and leadership lessons that are adapted in an organization from a music activity and performance. Besides the various other psychological, social, physiological benefits of music (I discussed and wrote previously); this is something you need to know to explain your employers on utility of music from a team relationship perspective. Music is increasingly becoming part of corporate as employee engagement tool. Various attributes of a musical performance/activity are welcomed and aspired in organization. 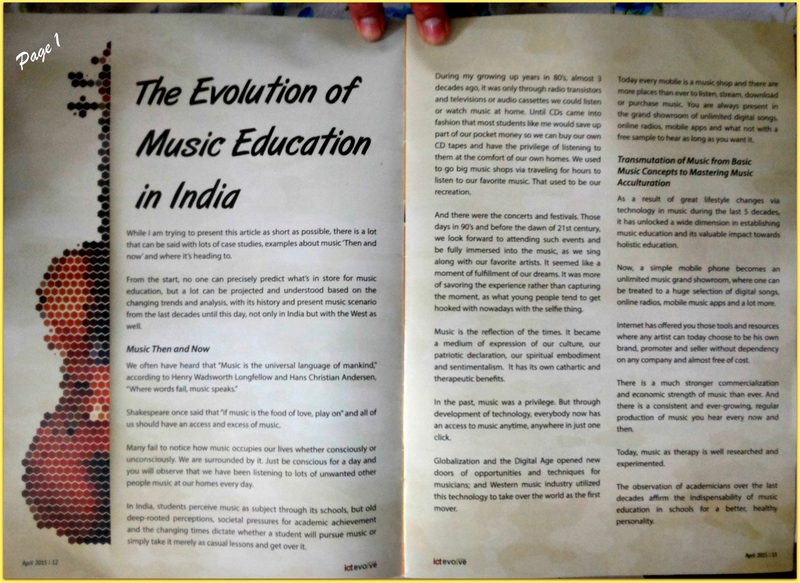 It is also the same reason why school/college also emphasize on musical performance along with musical learning. A CEO is just like a Music Conductor with team of talented people or musicians. He follow-up & take out performance from them at the right timing. Multiple performers bringing outcome, without any ego clash, at the required time, for the common musical piece. Conductor/Music Director plans a music, hire talents & reward them, guide them how to perform, stay accessible and visible to them. And above all holding an inherent respect for all talents, sharing the stage and credit with them. All these elements are so easy to comprehend through music. This is what describe a good team & leader. Besides that all Musicians always share a natural passion, energy, heart, emotions, involvement and sincerity to task. Academicians/Employers are always impressed on this beauty of musician and musical performance, which they impress into their employees. 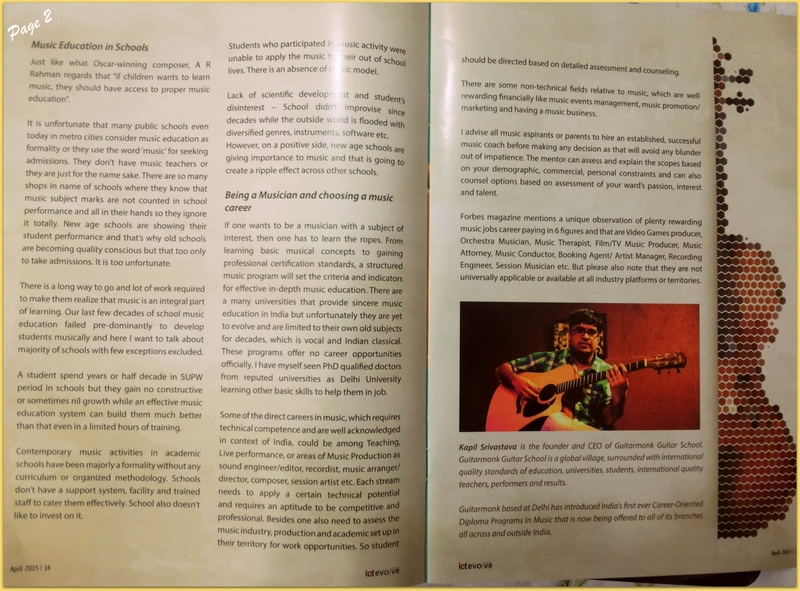 Last Days; I happened to counsel many parents seeking music career options for their Children at different platforms. Most parents (in their emotion and extra involvement with their Kids) thinks their child is unique i.e. full of Energy, Passion, Imagination for music. Some of their kids plays guitar and sing etc. And that’s enough of a commitment for them to be a good musician. I always tell them that I never found any single musician without these 3 qualities in my life. It is rather the other 3 that you would need more i.e. DIRECTION, PERSISTENCE & CRAFT. Imagine a charged vehicle without a Guide. Energy without Direction, Passion without Persistence, and mere imagination without the Craft is a waste. Today I got my new Roland Acoustic Guitar Amplifier from our owned Guitar Store. This is AC 60 Model. It was for sale but I wanted it to be in my personal assets. Quite expensive at almost Rs. 40,000 & very small but very handy, awesome sound, beautiful rosewood finish etc. It has many good points. I am trying it for a solo guitar show after two days. I hope it will cover the size of 1000 sq feet while maintaining the beauty of sound. I will be using both AUX in and other keyboard track. Will play something on it and share its sound to you soon.